The seedings for Friday's Betfred League Cup first-round draw have been announced. Eight groups comprising five teams each will be drawn, with sides playing each other once in the group stage. 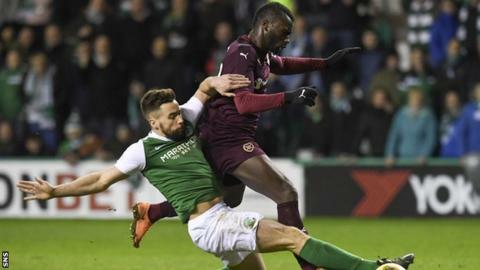 Hearts are one of the eight top seeds and Hibernian are one of the second seeds, with 24 unseeded teams. Group winners and the four best runners-up progress to the second round, when Scotland's European representatives enter the competition. Celtic, who will feature in the Champions League qualifiers, and Europa League qualifying participants Aberdeen, Rangers and St Johnstone all have a bye into the second round. At the group stage, there are four 'north' groups and four 'south' groups. There are 38 teams from the Scottish Professional Football League, who organise the League Cup, as well as Highland League champions Buckie Thistle and Lowland League winners East Kilbride. Each group will contain one top seed, a second seed and three unseeded teams, with seedings based on league position in season 2016-17. Drawn matches at the group stage go straight to a penalty shootout after regulation time, in which case both sides take a point and the shootout winner receives a bonus point. Dundee and Dundee United are seeded differently in the north section and, like Hearts and Hibs, could be drawn in the same group. The new format for the first round was introduced last season and the tournament was eventually won by Celtic, who beat Aberdeen in November's final.